We’d love your help. 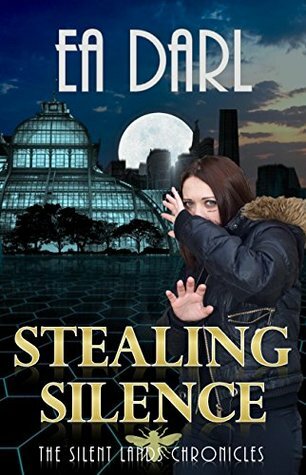 Let us know what’s wrong with this preview of Stealing Silence by E.A. Darl. The land is dying. As resources dwindle, the population is placed at the mercy of a secretive government, which operates on its own agenda. Critical top-level scientists researching the ecological disaster have gone missing, their disappearance a cold case file that haunts the local constabulary. Desperate for answers, the police captain hatches Orphaned. Alone. Starving. Desperate for answers, the police captain hatches a plan to recover a critical key to the land’s survival. What they need is an experienced thief, and they know just the girl. Avalon is not just any burglar; she is an uncommonly good one. Caught in the act of stealing, she is recruited against her wishes to pull off the boldest heist ever: to raid the high security government facilities. To ask other readers questions about Stealing Silence, please sign up. Into this mix comes Avalon, a young woman trying to care for her sister and avoid dying by inches from star Most dystopian books - at least the ones I've read - focus on the world falling apart from war or some external input that tears the fabric of the world apart and spits on it. Darl's precipitating event was ecological, a slow slide into chaos as the food begins to run short. The world ended not with a bang, but with a whimper, leaving everyone with too little to eat and an uncertain future. Into this mix comes Avalon, a young woman trying to care for her sister and avoid dying by inches from starvation. After she gets popped for trying to steal food, Avalon winds up in the middle of a crazy plan to find out just what the heck caused the devastation and what can be done to fix it. Stealing Silence does a good job with its protagonist, focusing most of the narrative on her point of view. One of the things I would have liked to have seen, and perhaps subsequent stories in the series will cover it, is getting a look at the world through the eyes of others. We get hints that there's a lot going on outside of the main story, but the story is tightly focused. Not that that's a bad thing, mind you. But I would like to see more of the world in future stories. What a great beginning to a series. I liked the concept and the story did not disappoint. A bit of action, mystery, and a world slowly dying due to scarce food, the story was fast paced without felling rushed. Just enough background was included to hook me in. I was just sad that it ended, but know the others are coming out soon so I can see what happens next. I really liked that the story was not depressing or nasty or boring in the slightest. Just a great book that was well written! Such an exciting story. The days that only the government can give the food needed for the human body, why? Avalon, a teenage girl was caught stealing food from a government greenhouse. Sent to jail and was quietly taken out to help find out what was in the fertilizer used in the greenhouses. Love this book! I received a complimentary copy of this book. Good short distopian story. Usually There is an apocalypse but here its something different. Something happened to The soil and in the end food started runing low. In that kind of World - Avalon lives outside of the community. What will happen when she will be catched by Cops? And who did this to The soil. If you like distopian reads but with no zombies or anything spectacular its book for you! What a beautiful story. I was captivated right from the start. A young girl is an expert thief but is stealing simply to live and to feed her and her sister . She gets caught but turns out the police men that caught her is one of the good guys. I won't spoil the story line but needless to say I will be following the story with extreme interest . Another winner here I think. This is not a Genre that I usually read but, I grabbed this and jumped right in and wow, it was great. A real page turner and something you can read in one sitting. I think these young ladies are a force to be reckoned with and I look forward to what comes next. A clever and brave heroine in a book appropriate for a mid-grade reader. Different from what I usually read, but excellent. I’m off to read the next one! Stealing Silence, or as Kindle prefers to call it “Stealing Silence: An Ecological Dystopian Adventure - The Silent Lands Chronicles: (Book One of The Silent Lands Chronicles) An Ecological Dystopian Adventure” is definitely a great book, whether or not you want to use the ridiculously longer version of it’s name. Actually, to be fair, that long name is pretty accurate. This really is a pretty darn good “ecological dystopian adventure” with a premise that’s actually (scarily) possible. I’m actual Stealing Silence, or as Kindle prefers to call it “Stealing Silence: An Ecological Dystopian Adventure - The Silent Lands Chronicles: (Book One of The Silent Lands Chronicles) An Ecological Dystopian Adventure” is definitely a great book, whether or not you want to use the ridiculously longer version of it’s name. Actually, to be fair, that long name is pretty accurate. This really is a pretty darn good “ecological dystopian adventure” with a premise that’s actually (scarily) possible. I’m actually not a big fan of dystopian novels but I tried this one because I know that “E.A. Darl” is a pen name for Susan Faw and I am a big fan of her work. Now that I’ve tried it I’m glad I did. Avalon is a really neat character and this book has all the traits (character development, exciting plot with great pacing, strong lead and supporting characters and excellent writing) that make me love this author’s books so much. I really loved this book. The concept is intriguing and unique. Avalon is interesting and actually lives up to her reputation. One of the problems I've encountered in other books is that we're told how amazing the protagonist is at a specific thing but then they fail over and over again so we're not shown how they deserve their reputation but thankfully Avalon is adept at her skill set. The writing is done so well I didn't even realize time was passing. I was so sucked into the story that I didn I really loved this book. The concept is intriguing and unique. Avalon is interesting and actually lives up to her reputation. One of the problems I've encountered in other books is that we're told how amazing the protagonist is at a specific thing but then they fail over and over again so we're not shown how they deserve their reputation but thankfully Avalon is adept at her skill set. The writing is done so well I didn't even realize time was passing. I was so sucked into the story that I didn't even hear my dogs begging to go outside or my husband trying to talk to me. I was right there with them all, struggling, laughing and heart pounding away. Once I started reading couldn't stop.